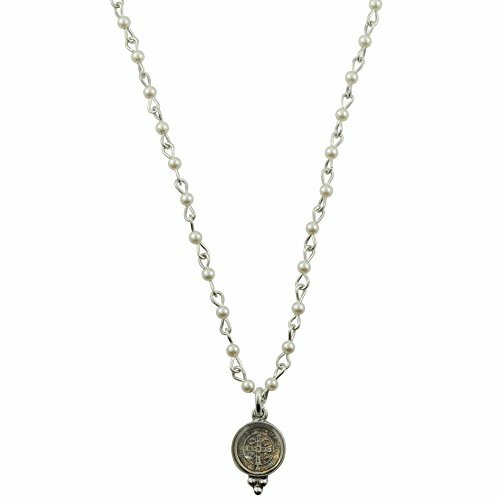 VSA Designs - Virgins, Saints & Angels Piccolo Lucia Choker - Silver + Pearl. Dainty pearls woven with gold and accented with a pendant that brings peace and protection to all that wear it - the San Benito Medallion. Wear alone or layered with your favorite VSA pieces.Necklace Measures: 13" - 16.5". Pendant Measures: .5". Silver Overlay. Handmade in San Miguel. Necklace Measures: 13" - 16.5"
If you have any questions about this product by VSA - Virgins Saints and Angels, contact us by completing and submitting the form below. If you are looking for a specif part number, please include it with your message.